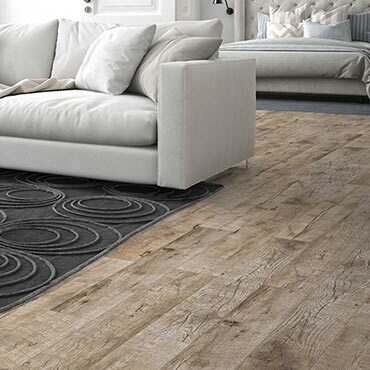 Inhaus Laminate Flooring is proud to offer laminate floors that are of the highest value. These floors offer unrivaled authentic looks, high durability, an easy to use installation system, low maintenance cleaning and a performance you can depend on. Laminate floors are all about value. Inhaus laminate floors offer an unrivaled combination of great looks, durability, easy maintenance and simple installation. Inhaus Laminate Flooring are durable. Designed for busy homes (with their busy pets) Inhaus laminate floors provide incredible wear resistance that won't fade or stain. Inhaus Laminate Flooring of striking visuals. With our latest in printing and finishing technology, Inhaus laminates not only look authentic, they also offer unique and innovative decors. Inhaus Laminate Flooring are easy to install. Our products are equipped with Megaloc, the most advanced patented glue-less installation system available. Megaloc is preferred by both professional and DIY'ers alike, due to its speed of installation and ease of use. Inhaus Laminate is quality, inside and out. A product is only as good as the quality that goes into it—which is why we use the best of everything. Our laminate flooring consists of the highest quality materials layered and laminated together in a single vertically integrated factory ensuring the highest quality possible. Inhaus Laminate Flooring is made in Germany. Inhaus is proud to be a part of the Classen Group of Companies based in Germany. With its rich heritage and commitment to innovation, Classen is truly a world leader in flooring. The quality of German manufacturing is world renowned—and the confidence it inspires is unmatched. As a German based company that is a pioneer and leader in laminate flooring, every stage of manufacturing, from raw material to finished product, happens under our roof—ensuring our floors are safe, of the highest quality and something we can truly be proud of.